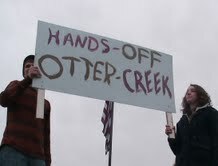 No bids on Otter Creek, students stage walkout. The Montana State Land Board received no bids for Otter Creek coal by the 5pm deadline Monday, February 8th. Though four of the five members of the Land Board voted to receive bids from companies to mine 616 million tons of coal at Otter Creek, near Ashland, MT, the only response submitted was a letter from Ark Land Co. saying that the price was too high. Ark, a subsidiary of St. Louis based Arch Coal Co., and infamous for swindling property owners out of their families’ lands in Appalachia for King Coal’s war on mountain tops, is reported to have stated that the royalty price of 12.5 percent was more than Ark is willing to pay. Though no alternative royalty rate appears to have been suggested, state law requires a minimum of 10.5 percent for coal mined from any state-owned land in Montana. The Land Board convenes next Tuesday, February 16th, in Helena to discuss their next course of action. They have the option of lowering either the royalty or bonus bid prices in hopes of winning over some bidders. They could also decide to stay true to some board members’ December 21, 2009 affirmations that the state will not subsidize Otter Creek development through rock-bottom prices. “The State of Montana will not subsidize the Tongue River Railroad,” said Gov. Schweitzer during the December 21st meeting, referring to the rail line proposed to provide easy access for Otter Creek coal to the national rail system. The railroad has been opposed by area property owners and ranchers for over three decades due to excessive ecological, social and economic impacts it would impose on the Tongue River area. 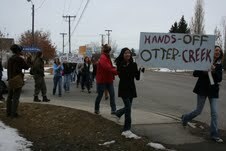 Big Sky students rally against Otter Creek coal. Students walking out of class in protest. On Thursday, February 11, the Montana Department of Natural Resources and Conservation will submit its official recommendation to the Land Board about a next course of action to be taken at the February 16 meeting. It is worth mentioning that the only member of the Land Board to vote against leasing Otter Creek at the last meeting is Denise Juneau, the Superintendent of Public Instruction, the very institution that would supposedly benefit financially from mining Otter Creek! If other members who voted for leasing the coal tracts only on the condition of getting maximum income from the lease stay true to their words, then next week’s meeting could result in an end to this whole misguided attempt to destroy pristine Montana land. A refusal to lower the bid and royalty prices may effectively protect Otter Creek… for now. Join Northern Rockies Rising Tide and others at the next Land Board meeting, 9:00am on Tuesday, February 16, 2010 at the Montana State Capitol in Helena. 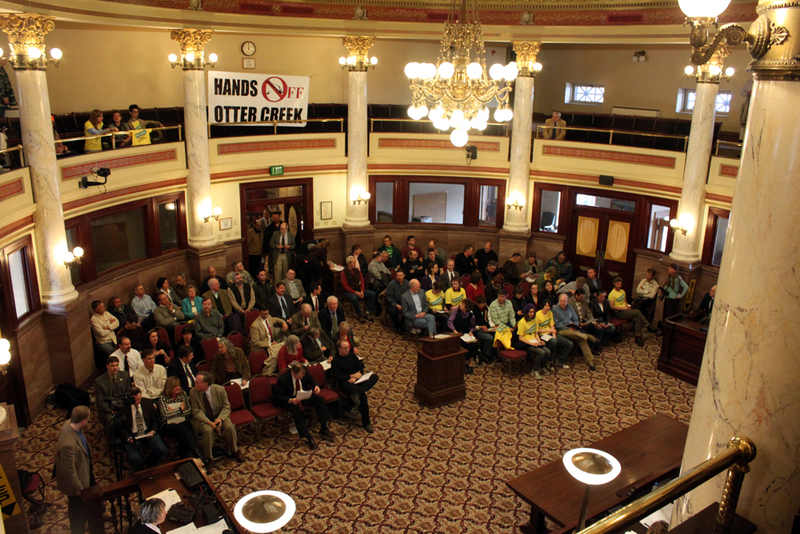 Help us make sure that Montana’s top politicians know that their attempts to mine Otter Creek are lacking the consent of Montanans!